The French house outfit's fourth studio production, Random Access Memories, became the fastest selling album of the year, selling 165,000 copies during its first week. It beat a record set by Canadian crooner Michael Buble's To Be Loved last month, according to the Official Chart Company. The single that propelled Daft Punk to the top of the chart, Get Lucky featuring N.E.R.D's Pharrell Williams and Chic's Nile Rodgers, was knocked off the top of the singles' chart after four weeks by La La La, by Naughty Boy featuring Sam Smith. But Get Lucky has become 2013's biggest selling single so far, selling more than 711,000 copies since it went on sale six weeks ago. 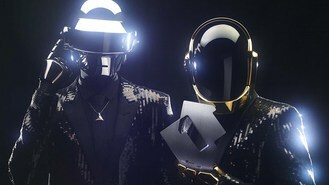 Martin Talbot, the Official Charts Company's managing director, said: "After the massive success of their first Official UK Number 1 single Get Lucky, it is little surprise that Daft Punk have also secured their first Official Number 1 album in the UK, too - but they have done so with some style. Having now claimed the fastest selling album and the biggest selling single of the year, Daft Punk truly are the musical phenomenon of 2013 so far. Viva les robots!" Naughty Boy's chart-topper became his first number one and the fastest selling single of 2013 so far. The Emili Sande collaborator, real name Shahid Khan, has worked with the likes of Cheryl Cole, Leona Lewis and Professor Green. He began his career as a music producer in 2005 after getting a grant from The Prince's Trust to establish Naughty Boy Recordings and later that year won £44,000 on Noel Edmonds' hugely popular game show, Deal Or No Deal, which he used to buy more recording equipment. La La La clocked up sales of over 145,000 copies during its first calendar week on sale, according to the Official Chart Company.